Produktinformationen "SHERLOCK ABOMINABLE BRIDE WATSON / HOLMES 1/6 2-PACK FIGUREN SIGNED EDITION"
From Big Chief Studios. As part of a psychoanalytic hallucination, Sherlock is transported back into the Victorian era to solve the crimes that no one else could. During his hallucination Sherlock encounters the impossible - an undying "ghost" who returns to murder specifically targetted individuals. After various deductions, help from his engorged and be it greedy brother and several reality checks, Sherlock deduces how to solve the case and reveal the real murderer. 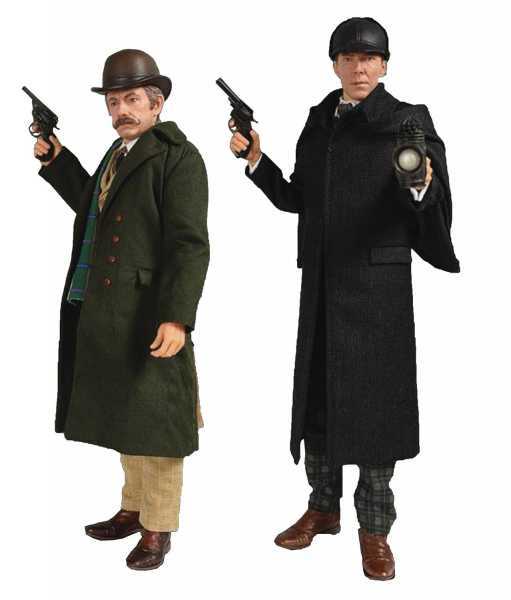 Officiailly licensed by the makers of Sherlock, Hartswood Films, each figure features a fully realised likeness of Benedict Cumberbatch, outfitted in a tailored Victorian three-piece suit, caped overcoat and his deerstalker hat, the figure comes with numerous accessories featured in 'The Abominable Bride' episode and a display base. Weiterführende Links zu "SHERLOCK ABOMINABLE BRIDE WATSON / HOLMES 1/6 2-PACK FIGUREN SIGNED EDITION"
Weitere Artikel von BIG CHIEF STUDIOS LTD.
Kundenbewertungen für "SHERLOCK ABOMINABLE BRIDE WATSON / HOLMES 1/6 2-PACK FIGUREN SIGNED EDITION"